God, I hate those Mormons next door! Blessed be the New Founding Fathers for letting us Purge and cleanse our souls. Blessed be America, a nation reborn. — opening titles, THE PURGE. It is 2022 in America. The country is doing well, if the opening titles are any indication: unemployment at 1%, crime at an all-time low. And there is one night of the year where all crime, including murder, is legal. The annual Purge. That’s what happens when you have two terms of a mentally deficient, narcissistic, egomaniacal, xenophobic, whine-tweeting, white supremacist president in the White House. 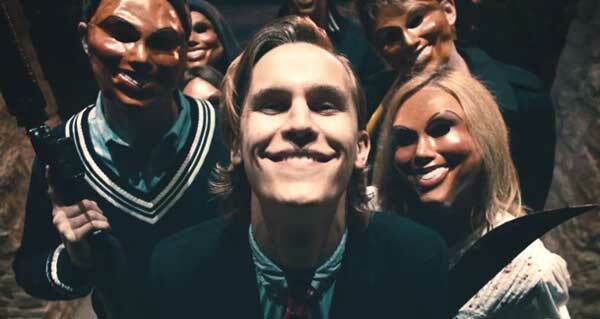 THE PURGE is a great concept that runs off the rails in a direction that was probably not the most interesting one. It’s not a “bad” movie – but a wasted opportunity. Think about it: a government-sanctioned annual purge where anyone can commit any crime for 12 hours, from 7pm to 7am. Which means the movie turns into a simple standoff: bad people outside trying to get inside, and good people inside holding them off. Until the big finale where the outside people get inside and fight fight fight guns machetes vases over heads blah blah. All while missing the fantastic overarching concept of the Purge itself! It’s like Spielberg and Crichton having DINOSAURS in their story, and simply turning them into villains to run from. 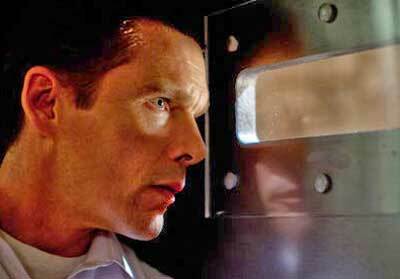 Ethan Hawke is dad, a security system salesman, who made a killing (so to speak) by selling everyone in his gated community a security system for the Purge (a plot point which will come back to haunt his family later). Lena Headey is mom. Max Burkholder and Adelaide Kane are their two teen kids. First annoyance is dad turning on the house’s security system less than one minute before the Purge siren goes off. On a night when murders are imminent, wouldn’t you do that IMMEDIATELY? Second annoyance is: the boy sees a bleeding stranger calling for help outside and disarms the system, letting the stranger into the house. But haven’t the filmmakers just told us the Purge is passé? Aren’t bleeding strangers outside par for the course? And if not, the boy is old enough to understand the consequences of his action. Sure enough the stranger’s pursuers end up at dad’s fortified front door. At first, the scene is chilling, as Polite Leader calmly asks for the stranger to be handed to them. The “realistic” facemasks the pursuers wear are also distracting us with their powerful horror visuals. Until we realize – the movie has turned into a simple standoff situation, and the novelty of the Purge has already worn off. So no matter how much skulking around in the dark trying to find the stranger, and no matter how many girls skipping gaily in diaphanous gowns carrying machetes, it’s nothing more than knife-kill dressed in future pants. Starring: Ethan Hawke, Lena Headey, Max Burkholder, Adelaide Kane, Edwin Hodge, Rhys Wakefield, Tony Oller, Arija Bareikis, Tom Yi, Chris Mulkey, Tisha French.